Works on unpaved roads(off-roads) is so difficult. 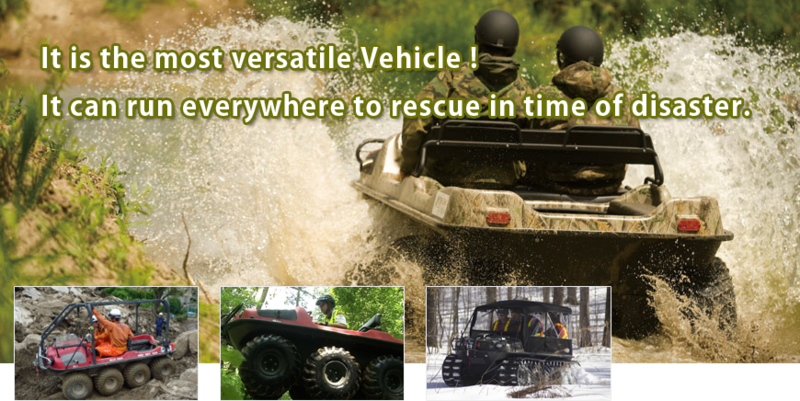 However ARGO can run everywhere in all weather, it becomes easier than other vehicle. Argo is not better than other specialized vehicles, but it show its ability as good as them in various kinds of works. So, only you have Argo, you can do various kinds of works. 2,How Works in the time of disasters? In the time of disasters, we need our swift action. In that situation, it is rare to go into the road of difficult condition but argo can go. At that time, we have to rescue human lives, to carry relief supplies, to restore rapidly. 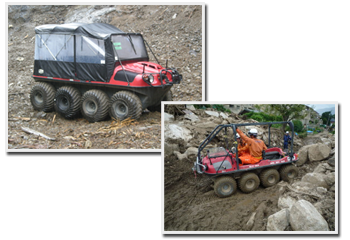 Even the road condition is unusual because of obstacles such as rubble and muddy condition, Argo can works. In addition to this, seat is large, so we can carry more supplies and can remove more rubble. In 2011, Typhoon strucked in Totsukawa village(Nara prefecture). Before using argo, rescue parties took 40 minute by walking to go into the site. Thanks to Argo, they restore the place rapidly. In 2014, Sediment disaster happened in Hiroshima city. Heavy machinery could not go into the site because the road was narrow. So, they used Argo everyday to carry supplies and people of rescue.